The settings for Craig Zobel’s 2012 behavioral experiment Compliance and the director’s new post-apocalyptic tale Z for Zachariah couldn’t be more different. The former takes place almost entirely in the claustrophobic confines of a fast food restaurant’s employees-only areas. The latter unfolds amidst lush, bucolic tranquility. Yet at the heart of both films is a study of group dynamics. 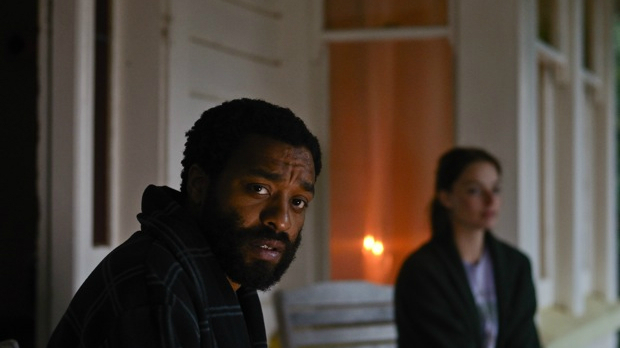 Set in an idyllic valley mysteriously immune to an extinction-level catastrophe, Z for Zachariah begins as a two-hander featuring Margot Robbie as a Christian farm girl who believes she’s the last person on earth until the arrival of an atheist scientist played by Chiwetel Ejiofor. The pair tiptoe tentatively around the sexual tension until the third side of the relationship triangle materializes in the form of a polite but shifty-eyed Chris Pine. The movie’s cinematographer Tim Orr spoke to Filmmaker about the looming influence of Tarkovsky, illuminating by candlelight, and how a movie set in rural America ended up shooting in New Zealand. Filmmaker: Like your frequent collaborator David Gordon Green, Z for Zachariah director Craig Zobel also attended North Carolina School of the Arts with you. It’s incredible how many filmmakers and actors came out of that program from roughly the same era – Danny McBride, Jody Hill, Paul Schneider, Jeff Nichols. Orr: Craig was one or two years behind the class that David Green and I were a part of and we have been friends for a long, long time. He was a part of a lot of the David Gordon Green-directed films and it was a long time coming for him to get to make some of his own movies. Adam Stone – who shot Great World of Sound and Compliance for Craig – was doing a Jeff Nichols movie and couldn’t do Z for Zachariah. So Craig asked me and I had always wanted to work with him. It was great to be able to travel the long road to New Zealand and make this movie with him. Filmmaker: How is your preparation different for a more traditional narrative like Z for Zachariah compared to the more lyrically inclined recent David Gordon Green films like Prince Avalanche or Manglehorn? Orr: Certainly it is a bit more planned, but what was great about Z for Zachariah is that it becomes a very intimate thing. There were only three actors and for more than half the shoot it was only two actors. So even though it’s a more classically orchestrated and in some ways precise film, you still just get in the room and block the scene. You still have room to figure things out and come up with ideas on the spot. Beyond that, it’s just sticking true to the rules that we made for ourselves and the tone we are trying to capture. Filmmaker: Can you expound on some of those rules? I’ve heard Zobel talk about ’50s post-apocalypse movies such as The World, the Flesh, and the Devil and also the films of Andrei Tarkovsky as references for Z for Zachariah. Orr: Craig and I talked a lot about Tarkovsky, especially movies like The Mirror, Stalker, and even elements of the first quarter of Solaris. Some of that came through in the way the landscape becomes part of the story. And that’s easy to do when you’re in a place like New Zealand, which has spectacular scenery. That said, as much as it’s about the exterior world around them being this Eden-like paradise that frames everything in it, it was ultimately about capturing the emotions of the actors and a lot of that plays in formal close-ups. Filmmaker: How would you describe what makes the look “Russian”? Filmmaker: Robert C. O’Brien’s source novel is written in the form of a diary by the character or Ann. For the film version, you’ve changed the perspective to a much more neutral point of view. Orr: Craig and I definitely talked about point of view. If it’s anyone’s movie, it’s more Ann’s movie, but she’s certainly a bit more of a passive character. Ultimately this becomes a triangle and we tried not to pin it to just one particular character’s point of view. Filmmaker: There’s a stretch in the film, just before Pine’s character arrives, where there’s a series of very long, takes. Was that preplanned or did that rhythm present itself in the editing process? Orr: We would do a very minimal amount of coverage, but whenever we could let something play in one shot or sometimes in two shots, that’s the way we would try to stage it. There are other scenes that obviously demand a different kind of coverage. That’s certainly true of the dinner table scenes – and there are several scenes of people eating. (laughs) That was simple, traditional, everybody-gets-their-shot kind of coverage and that’s what was necessary for the storytelling. Filmmaker: But even in those dinner scenes, the coverage is sparse. It’s usually just a master and each actor gets one close-up size. There aren’t medium two shots or different sizes of close-ups for each actor. Orr: That’s a good example of making choices. There were several scenes where we didn’t want to connect the characters in the same frame beyond what was in the master shot. That was certainly something that was thought about and part of the tonal approach. Filmmaker: Z for Zachariah opens with Robbie’s character scavenging for supplies in an abandoned rust belt town, which in actuality is Welch, West Virginia. What can you tell me about that location? Orr: Craig found that town several years before. I think he was researching another script he was writing. It’s one of those places that’s weird and sad at the same time because so much of it is a ghost town now but it had its industrial heyday. It was a coal town and in the mid-twentieth century it was a bustling place. You would go to the couple of restaurants in the town that were still open and they’d have photos from the 1950s of what it was like and you saw the main street and you’re like, “Wow, what happened?” It was perfect for what we needed. That was the only part shot in America. This film was supposed to take place in the eastern United States, but everything else was shot in New Zealand. Filmmaker: This seems like the kind of project that would normally get pressured into shooting in Louisiana for the tax incentives. How did you end up in New Zealand? Orr: It came down to there being an actor window that landed in January, February, and March. So it was winter here, but the film had to be set in the summer which meant we had to shoot somewhere in the southern hemisphere. Our choices were someplace like New Zealand or South Africa. New Zealand was great. It’s a very beautiful and idyllic setting, but it’s also got a great crew base. Filmmaker: I’m assuming that Ann’s house was already standing, but what about the other locations such as the convenience store and the church, which is crucial symbolically because Ejiofor’s character wants to tear it down for a hydroelectric power project. Filmmaker: I couldn’t help but think of Fitzcarraldo as the characters lugged the giant wooden wheel down to a remote waterfall. Orr: That was an endeavor. The house, convenience store, and church were all in the same area, but the waterfall was a couple hours away. Everything had to be helicoptered in. All the set pieces, the water wheel, and the gear had to be choppered in and out every day. Then the crew had to hike in. I credit the crew because they’re used to working in places in New Zealand where access is difficult. It’s not like you just walk up and there you are. They did a great job in pulling that off. Filmmaker: Did you shoot everything at that main house practically or did you build any interior sets? Orr: No sets. That was the most difficult thing because it’s a movie that takes place without electricity. For the night interiors, we had to rely on candles or moonlight [as our motivating sources] and that’s one of the hardest things to do well in cinematography. It has to feel realistic, but you still have to be able to see people. Also, all the night interiors had to be shot day-for-night. Filmmaker: You didn’t have any night shoots? Was that because of some work restriction in New Zealand? Orr: It’s a complicated explanation, but it ultimately had to do with crew turnaround. The crews in New Zealand, to their credit, they…. Filmmaker: ….actually have humane hours. Orr: Yes. They have humane working hours and their turnaround was slightly longer than the actors. So it would’ve been very difficult to turn the crew around and shoot nights. At first I tried to ND the windows and got an extraordinary amount of infrared pollution. I tried different fabric on the windows to alleviate that because I still wanted to have some sort of tone outside the window. Then eventually I had to rely on tinting the windows. That was certainly a challenge. Filmmaker: How did you approach lighting the night interiors that are ostensibly illuminated only by candlelight? Was it difficult to use anamorphic lenses for those scenes, since they are typically at least a stop slower than spherical high-speed primes? Orr: We shot Alexa and I used Panavision anamoprhics, mainly E series, and a lot of those lenses are T2.0s. The interesting thing I’ve found with digital is that you can do some things with it that you could never do with film. For instance, you could never shoot those anamorphics wide open on film. Good luck having anything in focus. Really, good luck. But for some reason you can on digital and I think it has something to do with the flatness of the sensor. There’s no variance. When fillm goes through a gate there’s just a minor amount of movement that can affect the depth of field, especially if you’re on a very shallow depth of field lens like anamorphics and especially wide open. But for some reason with the Alexa, and you can probably extend this to other digital systems, the flatness of the sensor and the fact that you can see the focus right then [on the monitor], you can get away with shooting at a wider stop and it’s usable. I just pushed the camera as far as I could. I tried to stay at 800 ASA because you really don’t gain much by bumping that up – you’re just moving the curve around. I would shoot a 358 [degree] shutter, wide open. I would use as much candlelight as I could and then augment it with covered wagons and little light panels just to shape the light a little more. Often the candles would do a lot of the work. Filmmaker: Those Panavision E Series anamorphics sit in the middle in terms of age between the older C series and the never G series. Is there a specific quality to the E series you were after? Orr: Anamorphic — thankfully, because I’ve always loved anamorphic — has kind of come back to being a popular format with digital cameras. It’s a very nice marriage to digital sensors. I wanted something that was a little bit more vintage. The G’s are a lot cleaner and have a bit more contrast so I wanted either C’s or E’s. I’m more of a Panavision person than an Arri lens person. The E’s were what were available to me and we paired that with a Cooke zoom and away we went. You certainly got a bit of flaring issues from the candles with some of the anamorphic lenses, especially the 75mm or 100mm. It became a little bit of a thing. We could only use certain lenses in a certain way because of that, but I was still very happy with them. Filmmaker: We always talk a lot about lenses, cameras, and lighting, but finding the right location can be every bit as important to a shot. For example, when Chris Pine’s character shows up he’s established in a wide shot in which all the grass is yellowed and he’s bracketed by dead trees. Though we have no other reason too be, just the frame that contains Pine makes us instantly wary of him. Orr: We wanted to find a place that felt special and had a landscape dynamic enough to make a statement. We don’t [meet his character] just standing in the middle of the woods. We went up to the top of a wind-swept mountaintop and there’s a certain amount of sparseness to his frame and certainly that came out of careful location scouting. Filmmaker: Another striking shot finds Robbie’s character at the kitchen table slowly pushing a glass toward the edge as the camera zooms out. Then – after the glass falls off – the camera zooms in again. Orr: That’s a shot that’s directly lifted from the end of Stalker. (laughs) That was something that Craig wanted to do. There’s sort of an homage there. The framing was pretty much the same as in Stalker, but I believe they used a dolly move rather than a zoom. Where we shot, we couldn’t do it with a dolly so we had to mimic that same feel with a zoom. I always liked that shot. We threw in a few special effects there too with the window open and some dust and feathers in the air. Filmmaker: To finish up, I normally don’t ask about upcoming projects, but I read you recently shot a new Pee-Wee Herman movie. Orr: I was super excited to shoot that. I was always a huge Pee-Wee Herman fan growing up. My best friend in high school and I would get together and watch Pee-Wee’s Playhouse every Saturday morning. And, of course, I’ve always loved the first movie. [The new film] got sent to me late last year and I was like, “Oh, absolutely. That’s a dream project for me.” It was so cool for me to see Paul [Reubens] doing Pee-Wee again.